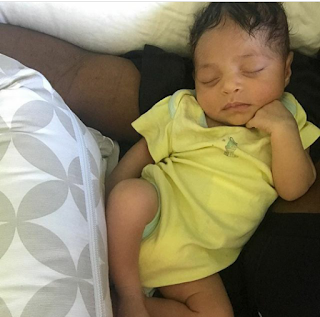 Welcome to worldbuzz99.com: Serena Williams Shares First Photo Of Her Baby, Olympia Ohanian Jr.
Serena Williams today shared the first photo of her adorable daughter Olympia Ohanian Jr, on Instagram. She captioned the photo, "Meet Alexis Olympia Ohanian Jr. You have check out link in my bio for her amazing journey. Also check out my IG store. The Tennis Legend and her lover Alexis Ohanian, Reddit co-founder welcomed their child on 1 September, however pictures of the baby were kept away from the public. Serena had booked an entire hospital floor because she wanted to have her baby in privacy. The 23 grand slam champion had her baby shower in Miami. In April, she shared a mirror selfie of 22week pregnancy with a lovely tribute to her unborn Olympia.